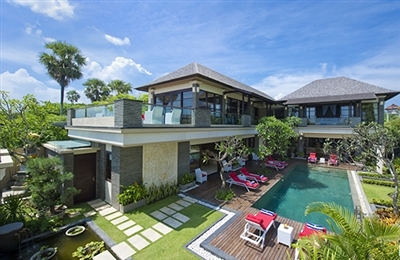 With a double-pool cascade among its many splendours, Villa LuWih is one of the most welcoming and beautiful villas we’ve escaped to in a long while. Arriving late at night in a slightly dishevelled state, we were quickly restored to a relaxed frame of mind after being met by LuWih’s fresh-faced, smiling team who had prepared our airport transfer service, rooms and snacks exactly as we’d arranged in advance. The sights and sounds of the night also provide a restorative ambiance, with the villa’s top-floor pool trickling into the big pool below, its soothing lighting and the whooshing symphony of the sea beyond. After a peaceful sleep in our canopied beds, we awoke and stepped out into a bedazzling scene. The sparkling green landscape Bali is famous for was in full view all around us, and if we looked further in the distance we could see a serpent’s tail of movement in the sea – a group of surfers riding the waves. With bedrooms spread evenly over the three levels and a mix of king- and twin-bedded rooms, a group of couples or extended families will find it easy to organise themselves. Those wanting more seclusion may find the two main-floor bedrooms a bit lacking in privacy, with the doors opening out to the dining and living areas. But this is a minor quibble, since with their own ensuite bathrooms complete with double bathtubs it’s easy enough to leave the world behind once the doors are slid shut and the curtains drawn. And they’re both just a quick hop from the big pool. Now, about these pools … Staying at a hotel with two pools is always impressive, but staying at a private villa with two pools is truly an indulgent delight. It was a first for us, and we had no excuses for not doing our daily laps. The shallow section for kids in the larger pool is a thoughtful touch, too. With so many staff here, our only concern before arrival was having too many people around! We were well taken care of, certainly, but never felt overwhelmed or over-serviced during our stay – they seem to have the balance of attention and discretion just right. Being pampered to the hilt is easy to get accustomed to. LuWih, by the way, means “big” and “luxurious”. Leaving the villa was traumatic. 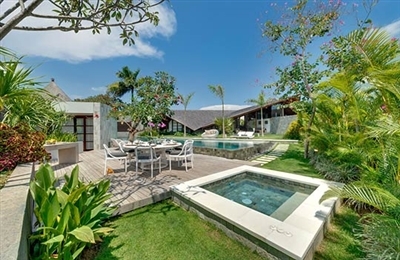 Villa Mako has a beautiful energy, probably because so much love has gone into the authentic Dutch Colonial design and antique furnishings. Unlike other villas that are monikered ‘colonial style’, we almost felt the need to don safari suits and complain loudly in Dutch about the damned heat! Conversely, the 21st century has a strong showing in the kitchen, bathrooms, TV room and dining areas. Comfort is by no means excluded in the desire for authenticity. 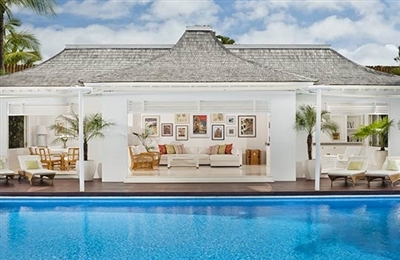 The garden is shaded by a large grove of coconut trees providing tropical poolside relaxation you won’t want to leave. 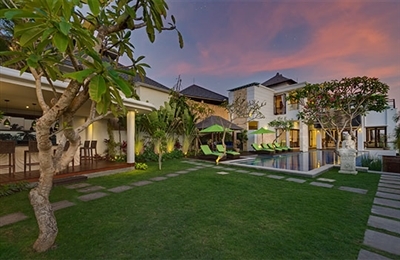 The villa’s rural village location allows you to interact with the friendly local people simply by ducking out the gate at the bottom of the garden. The seafood dinner, prepared for six of us at short notice by the cook was fantastic, beautifully presented with faultless service. The 36 cushions on the huge antique plantation sofa in the hall had us swimming in softness, while the kitchen just cries out to be cooked in. There are see-through cupboards, acres of bench space and a collection of tableware and glasses for every occasion and tipple. The lay-z boy chair in the media room may cause a few fights to break out, so play nice.